Spouses who wish to divorce or obtain a legal separation in Wisconsin and have children can complete a joint petition. This form FA-4110 is available on the website of the Wisconsin Court System. The document must be signed by both husband and wife before a notary public. Wisconsin Joint Petition For Divorce/Legal Separation With Minor Children FA-4110 Step 1: At the top of the first page, enter the name of the county in which you are appearing. Provide the full name and address of both parties. Indicate whether you are seeking divorce or legal separation with a check mark. Enter the case number you have been assigned. 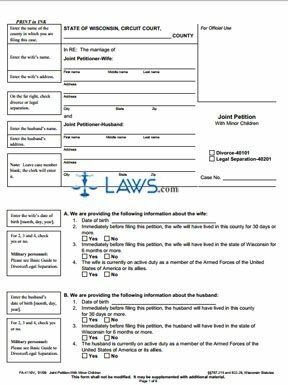 Wisconsin Joint Petition For Divorce/Legal Separation With Minor Children FA-4110 Step 2: In section A, enter all information requested about the wife's date of birth, residency status within the county and state, and whether she is a member of the military. Do the same for the husband in section B.
Wisconsin Joint Petition For Divorce/Legal Separation With Minor Children FA-4110 Step 3: In section C, provide the date and location of your wedding. Indicate whether you are seeking divorce or legal separation. In subsection 4, enter information about any previous such legal actions. Wisconsin Joint Petition For Divorce/Legal Separation With Minor Children FA-4110 Step 4: In subsections 5 and 6, detail both spouses' previous marriages, if any. Wisconsin Joint Petition For Divorce/Legal Separation With Minor Children FA-4110 Step 5: In section D, provide all information requested about your minor children. This includes any other people who have custody rights, all addresses the child has lived at for the last five years, and any legal agreements or orders already in effect. Wisconsin Joint Petition For Divorce/Legal Separation With Minor Children FA-4110 Step 6: Under the section headed "We ask that the court," indicate with a check mark whether you wish for the court to make a ruling on any form of support payments.